C'est une traduction de iPhone app with Python. J'ai eu une forte demande pour la version française. Une vraie app pour iPhone? Mais c'est un programme web, et pas une application faite avec xcode. gallery/geo.html et sur un iPhone, on l'ajoute a l'ecran d'accueil. On peut maintenant lancer le programme comme une vraie application iOS. J'ai déjà vu cela, non? Le code Python n'est pas sur la page, mais on voit qu'on y fait reference par src="navi.py"
On établis 2 fonctions de rappel (callback). Une si on a notre géolocalisation (navi), et une s'il y a une erreur (nonavi), et finalement, une autre fonction (navirefresh) pour s'occuper de l’événement onclick du contrôle auto refresh dans la barre de menu de l'application. Le démarrage initial se fait par un appel a geo.getCurrentPosition avec nos fonctions de rappel. Ça fonctionne assez bien comme GPS. Le CSS étant un peu long, je ne le mettrai pas sur mon blog, mais vous pouvez trouver le code sur le site brython.info ou sur googlecode: SVN repository. Le CSS pour l'interrupteur genre ios 5 a ete emprunté ici: ios-5-style-switch-control. Alors voila, c'est un point de depart pour faire toute sortes de choses. Un tracker pour le jogging, le velo (avec local storage et synchro par appel ajax) et bien d'autres choses. Vous pouvez désormais faire tout cela avec votre langage favori (Python, bien sur) que ce soit pour votre téléphone mobile ou tablette. Cet exemple est quelque peu spécifique au iPhone (surtout a cause du CSS), mais fonctionne sur Android aussi et peut être adapté facilement aux tablettes. Et cela ne m'a pas pris beaucoup de temps. But it is really a web application. gallery/geo.html then click add to home screen. You can now launch it like a native application. We are setting up 2 callback functions. One called if we have navigation (navi) support, one if we dont (nonavi), and finally a function (navirefresh) to handle the onclick of the auto refresh switch in the title bar of the application. This works pretty decently as a quick and dirty GPS application. The CSS is a bit long so I'm not posting it on the blog, but you can check out the source at the brython.info site or on the SVN repository. The ios style switch CSS is borrowed from this article: ios-5-style-switch-control. So there you have it. You can now use your favorite language (Python, of course) to write applications for your mobile phone or tablet. This example is slightly iPhone specific (mostly due to CSS), but the same basic structure applies to a variety of mobile devices. And it took no time whatsoever to write this. Sim, é genial, sem dúvida. De qualquer forma pode parar de sonhar com uma utopia, o que! Consola Navegador (Firefox fazer Ctrl-Shift-K, Chrome Ctrl-Shift-J, Safari Ctrl-Alt-I): Este é o código Python que foi executado. Veja esta página ( http://www.brython.info/test/test_clock.html ), o você vai ver um relógio analógico. E o código fonte da página? Sim, é um programa em Python! P.S. Nós Telecharge brython.js aqui: brython/downloads e como usá-lo (english). Lista Brython em português: forum/brython-pt. Esta semana, vou publicar no meu blog um aplicativo para iPhone escrito com Brython. 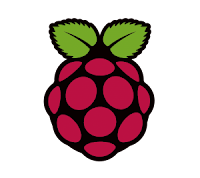 Note: This is a translation of the popular basic guide to Python on the Raspberry Pi: Python sur RaspberryPi 01 (in french), adapted where it made sense. For the experts, there's not much to see in this article. For everybody else who keep seeing references to Python in your research on the Raspberry Pi, and wondering why they keep talking about a snake, then this article will be perfect for you. Or perhaps, you do know that Python is a programming language. 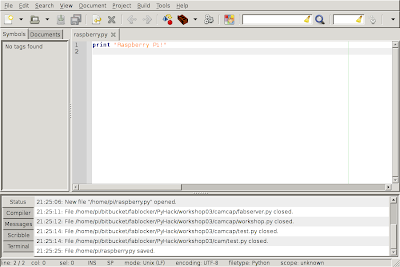 Welcome to our series of tutorials on the Python programming language, with a specific application to the Raspberry Pi. Before we get too far, I want to provide you with a few basic links. The first is to python.org. If you spoke another language, such as Spanish, Portuguese, French, Italian or Russian, I would point you to several other websites, because for other languages, individuals tend to have more complete sites than the official one (or, I should say, more in tune with the culture). But since you are reading this in English, python.org will become your primary stop. In english, there are lots of choices. In fact, too much. For example, on Amazon, you'll find over 1000 books on Python. Even checking out only hardcovers, you'll still end up with over 85 books! If you live in a big city, it is a good idea to go to your local book store, and check out what books they have. As I've taught some Python to others, and recommended some books based on their personality, I've noticed that almost everybody is different. One book that I like, you might hate, and vice versa, because we are all different. So you'll have to dig and see what book appeals to you, based on styles that vary from "Python for Kids", "Hello Python" and "Head on Python" to "Core Python Applications Programming" or even a "Python Essential Reference". There are many textbooks available too, some are assigned reading material for Python classes in colleges and universities, worth your time to check them out. Moving on to another editor, for many years, Dive into Python was another recommended book. It is available to download for free. Have you found a free ebook that should be mentionned here? If so, please leave a comment! So, Python is a programming language, but it is also an executable program. It is included with the Raspberry Pi and with most Unix type systems (Solaris, OpenIndiana, Mac OS/X and the varieties of Linux and BSDs ). It can also be installed on Windows, iPhone, iPad, Android etc. In this article, I will differentiate the python program from the language, by writing it in bold characters. 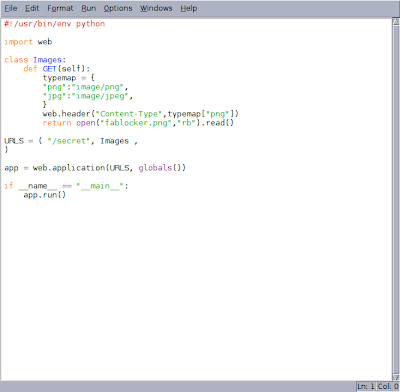 It is possible to use python in various ways or mode of operations. However, in our case, we are not done at all, we are barely starting! It is as good a time as any to mention at this point that a string that starts and ends with the triple quote ("""string of characters""") by itself, without instructions, is what is called a docstring, a string of characters (or sentence) for documentation purpose. A form of commentary, in other words. The word exit, followed by a pair of parenthesis, indicates that exit() is a function. We will come back to functions later on (and we will learn that print is a strange animal, that should be written print(), but that's for another time). If our code is quite short, there are no issues with using the interactive mode. But it might become burdensome to write the same code again and again. It's a good thing then that we can save our code in a file, whose name will end with the .py extension and that we can execute again and again. 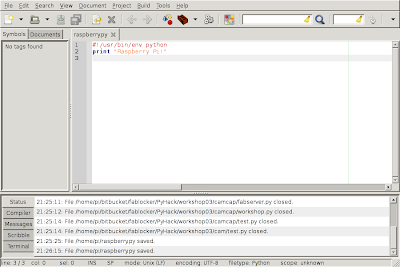 Let's save our program that prints "Raspberry Pi!" in a file. In order to do that, we will need an editor. For the experts, I would recommend something like scribes in graphical mode and vim in console mode (text). 0 upgraded, 2 newly installed, 0 to remove and 134 not upgraded. Need to get 3,401 kB of archives. After this operation, 8,682 kB of additional disk space will be used. Selecting previously unselected package geany-common. Selecting previously unselected package geany. We save, and we quite (for right now, so as to keep things simple). This is the second mode of operation, python running a script. We save after adding the new line, and we quite. 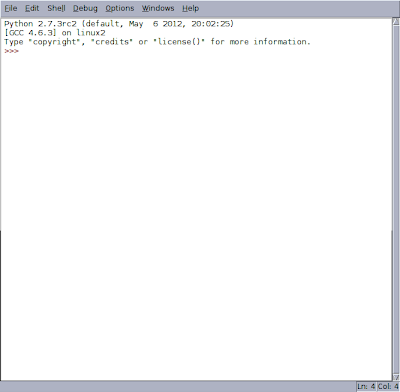 The line we've just added to the script tells the operating system shell which program will run this code. In our case, we specify python. 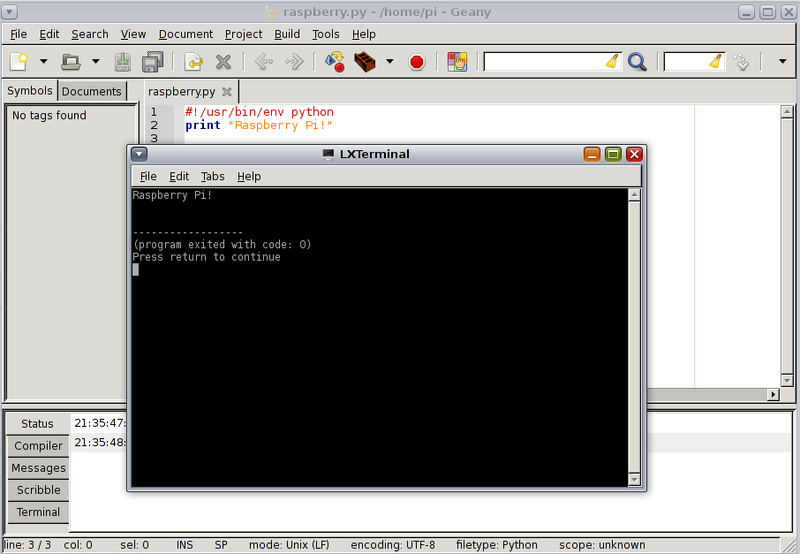 This concludes our first basic tutorial on Python on the Raspberry Pi. I hope that this was sufficient to get you started. Jusqu’à maintenant, en parlant de Brython, j'ai mis l'emphase sur le fait que tout roule du cote du client, dans la page web. Sur ce blog, par exemple, j'inclus même brython.js a même le gabarit de blogger, pour figer la version. Tout est ici. Et le Brython va aller chercher script.py (ou tout autre script python que l'on spécifie) avec un appel ajax, sur le serveur (avec certains navigateurs comme Firefox, en fait meme pas besoin de serveur, on peut faire un file open de la page web et tout fonctionne localement). Sur un serveur, comme c'est avec ajax, bien sur le script se doit d’être sur le même domaine que la page web. On pourra ainsi séparer notre structure (.html), nos embellissements (.css) et notre logique (.py). McDonald's is currently advertising that "every hero needs a sidekick". Of course, if you've been following my blog, you already know this for a fact. In the previous Sidekick articles (sidekick and sidekick 2), we saw how we could run a program on the Raspberry Pi, and the display would then be forwarded to another computer, through the use of X forwarding with ssh (-X). One side effect of that mode is that the program will detect the X Windows property of the PC, and not the Raspberry Pi. For example, if your X server on your PC supports Open GL, although the Raspberry Pi supports only Open GL ES 2.0, the program will see the full Open GL stack. It can be a good thing, but sometimes it can lead to surprises. Another limitation is the windowing. 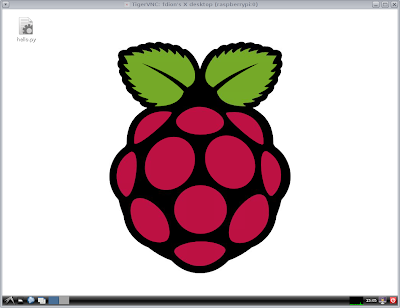 We now have 2 windows of programs running on the Raspberry Pi, but displaying on our computer's desktop. But sometimes it's important to have a full desktop. So how do we do this, to see the whole Raspberry Pi desktop? The solution is Virtual Network Computing (VNC). There are many implementations of the protocol, and they fall into 2 camps. and the kind that attaches to the original desktop. Before installing the server, let's talk about the client. On your PC, if you have a unix or linux machine, there is a chance that you have a program called vncviewer. Try it and see if you do. If not, you will have to install it. This will depend greatly on what operating system you run, as far as how to do that. If your desktop is a *nix, I'm sure you know how to use your package manager to get vncviewer. Under Windows you can get tightvnc for windows or you can try the multiplatform (Linux, Solaris, Windows, Mac) RealVNC. Many Mac users are partial to Chicken of the VNC. Tightvnc is of the first category of servers. This has the advantage that you can get a graphical desktop, even if your Raspberry Pi is on the command line, without X windows started. And that should work, when you access your Pi remotely with a client. And that should be it. After rebooting, it should start automatically. If you prefer x11vnc, then follow the next set of instructions instead. x11vnc falls into the second category of servers. It will attach to the X server of the Raspberry Pi. 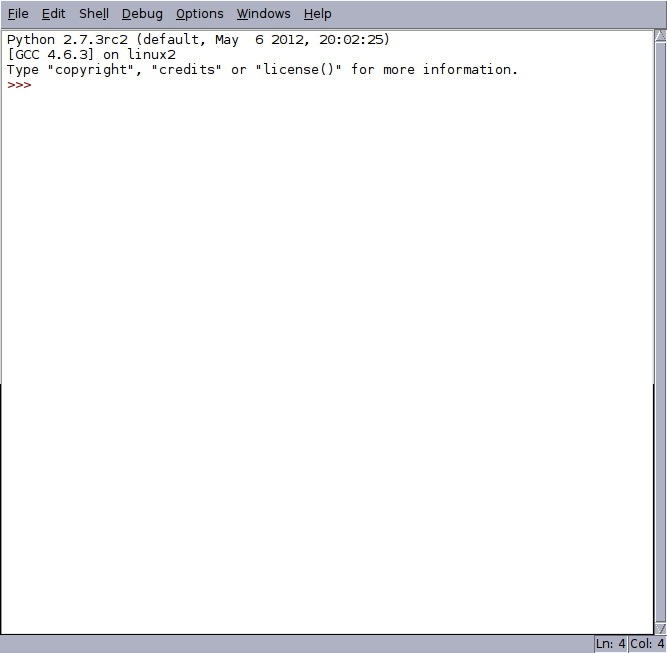 As such, you have to run LXDE, you can't stay in console text mode. Be patient on the last step, this is getting a startup file for x11vnc from my Brython playground site. It is usually pretty busy... Reboot the Pi and you should be set. Hacer la instalación de Cherokee Web Server en el Raspberry Pi con Raspbian es fácil, pero requiere tiempo. Y hay que esperar que la compilación se termina (mas de 30 min., me parece), con éxito (esperamos). El Pi es pequeño en cuanto a su tamaño, pero también en cuanto a la cantidad de RAM y de core en el CPU. En cuanto a un sitio de tipo dinámico, es posible hacerlo con un Pi, pero hay que pensar en la aplicación. Como servidor personal o de departamento, es bueno. Pero, y un blog? En mi caso, he notado que a veces hay 75+ visitantes al mismo tiempo. No es razonable esperar que un Pi puede hacerlo de manera dinámica. Por eso, vamos a ver lo que podemos esperar con Cherokee y un contenido estático. Luego voy a configurar el modo automático, pero por ahora es suficiente así. Ahora, podemos hacer una simulación de carga. Así que, me parece que con contenido estático (quizás generado por medio de Pelican), y con poco imágenes (en el test aquí, ninguna), si, el Raspberry Pi podría servir de servidor de blog. XYZ is the new RaspberryPi. Replace XYZ by several small form computers that have hit the market in the past year (particularly those powered by ARM). That is the claim being made again and again. We are already conditioned to a $35 price tag. A fully capable Linux computer with a fast GPU and gpios. And a DSI and CSI connector. You can bring more to the table, such as ADC, PWM, USB3, bluetooth or sata, but if the price is greater, then you are going in the wrong direction. To put things in perspective as to what $35 buys you, at a local retailer, an Arduino Uno (an embedded system, so in theory it should be cheaper) will set me back $35, and then I have to add a $40 ethernet shield if I want to get it on the network. I go to Barnes and Nobles, and I cant find a decent computer science book for that amount. So yes, the Raspberry Pi foundation set the bar high. Yet, it is impossible to ignore that. And the fact is that while $35 got you a 256MB Pi model B some months back, it now gets you a 512MB Pi model B. Just as we got comfortable with the Raspberry Pi model B, we are about to get a $25 version, with a lower power consumption. For a lot of projects, the model B was already overkill, so the model A will really further increase the perceived value of the Raspberry Pi platform. That is why we need $25 computers. It wouldn't surprise me if we see $20, or even sub $20 computers... If you were thinking $60, then as I mentionned, you are going in the wrong direction. Now that we've cleared this point up, makers of Raspberry Pi add-ons, you're the next contestants on the price is right. L'atelier PyHack qui est présenté par PYPTUG porte sur comment faire interagir le monde virtuel de la programmation avec le monde physique, avec Python, et souvent avec l'ordinateur Raspberry Pi. Mais pas tout le monde a un Raspberry Pi. Les ateliers, et aussi les tutoriels de ce blog, sont faits pour apprendre l’électronique et le langage de programmation Python. Les techniques Python enseignées ici, peuvent être appliquées a une grande variété de problèmes. Et donc, ca serait drolement bien si on pouvait rouler le meme code qui est fait pour le raspberry pi, sur un portable? J'ai donc décidé de m'attaquer au probleme. J'ai donc ecris un module RPi.GPIO de remplacement pour essayer le code pour Raspberry Pi qui inclus des access aux GPIO sur des plateformes autres que le Raspberry Pi. C'est-a-dire, votre portable. C'est un module Python (en fait, un package RPi qui inclus un module GPIO) avec une implémentation des fonctions setmode(), setup(), cleanup(), input(), output(), prends en charge les 54 GPIO (états et directions), modes broadcom et board, fonctions vides pour les 4 set_*_event() - peut etre dans le futur j'y ajouterai la logique, et un peu de vitriol. Non, pas ca! Et un peu de logique pour les erreurs (genre, essayer d'acceder a un GPIO avant de l'assigner). Il y a meme un mode de débogage (gpio.debug = True). Tout cela devrait etre suffisant pour rouler sur un portable du code Python fait pour le Raspberry Pi. Seul hic, pas moyen dans l’immédiat de simuler le changement d’état d'une entrée (simuler un bouton, par exemple). Sous solaris / openindiana, c'est disponible par packagemanager. On se retrouve avec les ateliers PyHack. RPi.GPIO l'imposteur fait partie du deuxième atelier. (RPi.GPIO l'imposteur n'a pas besoin de sudo, ce qui n'est pas le cas du module système). Sur un vrai Raspberry Pi, dans tout autre répertoire l'imposteur ne sera pas trouvé. Mais dans workshop02, si on veux rouler test.py sur les GPIO du Pi, il suffit de renommer le répertoire RPi, et ainsi Python ne le trouvera pas. Of course you have to have mercurial installed. But for the sake of our discussion, you don't need to do that right now. We are going to display the code right here, and then talk about it. Right away I knew that I would need to do something based on Bresenham's line drawing algorithm. 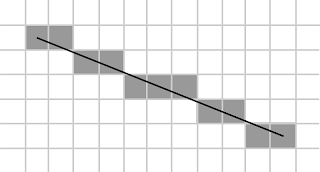 Horizontal lines are trivial (turn one motor), and so are vertical lines (turn the other motor). Perfect diagonals are also easy to accomplish, since it is just a matter of turning both motors at the same time, for each step. Based on the direction of the steps, 4 different diagonal directions can be done. Yet, with Bresenham's algorithm, you can do a line of any slope. In order to save time, I was not going to do special case handling, and just do everything with his algorithm. Bresenham's algorithm was also adapted to drawing circles. It is usually found under the name "midpoint circle algorithm". I also knew that I would be reusing the stepper() function I had designed earlier (see PyHack step by step article), and that meant importing the RPi.GPIO module and setting up the pins. I also wanted to have the demo code in a main() function, and only execute this if the program was run directly and not imported. That would allow me to use the program as a module also. With that in mind, all I had left was a function to move my X/Y assembly by so many steps, on an axis and a specific direction, and I already had one done for another piece of the workshop. Oh, and of course do the guts of my functions. Overall, it left me with very few choices as to how to implement this, given all these preliminary. Before we jump into the code, for any of this to make sense, you will have to read the PyHack step by step article, so you understand at least a little bit how stepper motors operate, and see some simpler Python code. It is also a basic library for steppers controlling an X/Y device. The main functions are line(x,y) and circle(radius). position to x1,y1. Negative number goes in other direction. mid point circle drawing algorithm - basically Bresenham's. minutes to write this. It needs to be cleaned up. drawing a circle at its current position, going right and down. 3:  It is also a basic library for steppers controlling an X/Y device. 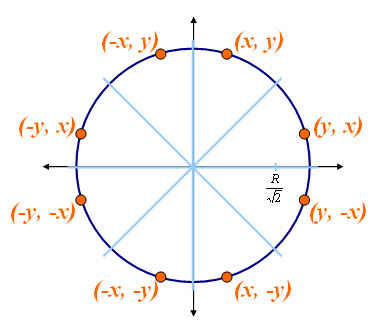 5:  The main functions are line(x,y) and circle(radius). You would want to add document encoding instructions at the top, on line 2, if you had to use strings with special characters or accents (like in french, spanish or russian). Logically the next step in a Python script is to import modules, if we need any. On line 7 we import RPi.GPIO but with an alias of gpio, so we don't have to fully qualify the namespace for every gpio function we call. Please use lowercase gpio. Uppercase in Python is usually for constants (yes, I know that the RPi.GPIO module name itself is not following the standard). Line 8, we import time, as we will need time.delay() to prevent stalling the steppers (we will use that on line 37). In Python, all uppercase indicates a constant. This is a convention, since there is no enforcing of the type. Line 10 defines the GPIOs for the first stepper (Broadcom GPIO nomenclature) while line 11 defines the GPIOs for the second motor. On a REV2 board, some of the GPIOs have to be adjusted. Specifically, GPIO21 is GPIO27 on a REV2. From these two lists, we create a new one combining all the pins on line 12. Finally, on line 18, we define the correction factor (to deal with hysteresis). This is the amount of stepping that has to be done to undo the slack in the Etch-A-Sketch when we reverse direction. We are now getting into the GPIO code. In an interactive session or a main() program, setallpins() has to be called before line() and circle() can be used. Line 25 sets the gpio module to Broadcom GPIO numbering (BCM). Line 26 establishes a loop that will iterate through all the elements of the list PINS, and call line 27 to set up each pin (element) as OUTput. On line 30 we are defining a function, with 2 required arguments, and an optional argument: a sequence and pins, and the optional delay (will default to 0.002 seconds if not provided). In other words, if the pin I'm looking at is in that step, return a gpio.HIGH value, else return a gpio.LOW value. We then pass that as the second argument to gpio.output(). The previous function does one step based on a sequence. This one leverages stepper() to do many steps. On line 40 we define the function, with steps as required and by default it will happen on the X axis. if we pass "y" (really anything else but "x") it will change sequence to the one that controls the other motor. On line 44 we build a tuple that will control motor A (x axis) or B (y axis), depending on the axis. It is again a ternary operator that is used. We are almost ready to call the stepper() function, but first, we have to figure out which direction we are going on the axis. On line 45, if we have negative steps, it means we need to reverse the sequence. We convert the negative number into a positive one on line 46 and use a reversed sequence on line 47 (RSEQA if we are on the x axis, else we use RSEQB). Finally, on line 48 we loop for the number of steps, calling the stepper() function for each steps. 56:    position to x1,y1. Negative number goes in other direction. First, I had to add support for relative positioning by adding logic to track the previous position. This is done on lines 61, 71 and 84. What I then had to do is to add lines 67 through 70, making sure there is something to do (is not 0 condition on lines 67 and 69) and convert the x and y coordinates into a relative movement based on the previously calculated position (lines 68 and 70). Lines 80-83 and 90-93 is more of the same. This could be refactored into a function and called at these 3 places. And that is a normal part of the coding process. The first pass, you spend only minutes on a specific area of a project, just enough to get it to the point where it can be easily read and maintained, but no more. Then later, when you are done, if you still have some time, do some R&R (refactoring and reengineering) of your code. It gets worse. Now we have to deal with drawing a circle. What I would suggest is to skip this code and go and check out the circle() function first, then come back to this. 98:    mid point circle drawing algorithm - basically Bresenham's. 102:    minutes to write this. It needs to be cleaned up. The code here is the midpoint circle algorithm. The main issue with that algorithm is that it is very efficient and generate points in a non sequential way. On lines 107-110 I set up the calculation initial state, before hitting a while loop. If you look at a circle, we can easily see that at a minimum, it is made for four identical quarters. And a quarter is mirrored around each axis. So, by calculating half of a quarter circle (1/8 of a circle, an octant), we have basically calculated all the points we need, simply by flipping the signs and axis. I've done something similar with lines 115, 117, 119, 121, 123, 125, 127 and 129. But since I am not using a bitmap and I want an ordered list of points (clockwise), I had to loop 8 times (line 106) and add if statements ( lines 114, 116, 118 etc) in front of every calculations. It is slightly slower this way, but at least I'm not calculating these points 7 times too many. Once a segment is complete (generated by the while loop on line 113), I add that segment to my points list, but with yet another twist. If the segment is odd, it has been generated through a mirror coordinate, so it was built in reverse. So we check on line 138 if the segment modulo 2 has a remainder. If it does (odd number) then we add the segment in reverse on line 139 ( [::-1] ), else, we add it straight on line 141. When we are done, we return the whole list, on line 142. Now we are talking. We'll draw a circle based on a given radius. It starts like the Bresenham line drawing algorithm. That's because we are drawing tiny lines. 148:    drawing a circle at its current position, going right and down. I wrote this, inspired by the line algorithm, but with a few twists. First, the line destination is based on a list of points that is calculated by another function (_circlepoints() ) called on line 150. I reset a counter on line 154 and figure out the total number of points on line 155. We will use this on lines 167-174 to correct the slop at the conclusion of each quarter of the circle, where we are changing direction. Line 158 is where I step through the points in the circle (a list of x/y tuples names points). Within the for loop, I increment the counter on line 159, calculate the deltas on line 160, save the previous value on line 161 and then lines 163-166 I do the move() logic that I've already covered in the line() function. Since this is the 4th time I do this boilerplate code, it tells me that there is an interface mismatch between what I thought I would need when I defined the move() function, and what I really needed. move() was defined for another project, so it makes sense that there is this mismatch. A quick fix would be to modify move() to accept not just a single value, but an x/y tuple also, and inside move() to exit right away if we have a zero value, or to call itself for the x and y axis (recursion). This would get the 4 line boilerplate code back to 1 line. If you want to see the end result, follow me on twitter @f_dion as I will send an update when I refactor the code. The main() function is our main demo program. On line 181, we setup the pins for output, on line 185 I loop with a radius that will start at 100, then will go to 125, 150 etc. We simply call the circle() function with that radius. Finally, on line 187, we cleanup, so the gpios are no longer outputs. This concludes our piasketch.py code review!